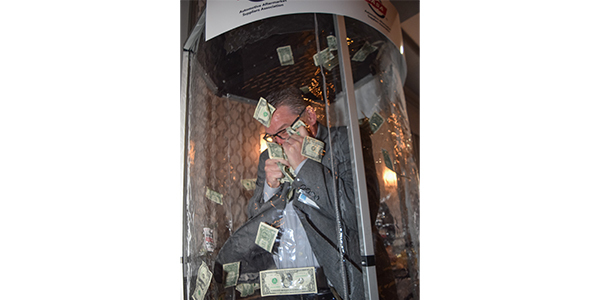 Attendees at the 2019 Automotive Aftermarket Suppliers Association (AASA) Vision Conference had the opportunity to “grab cash and grab a Council seat” while benefitting the University of the Aftermarket Foundation (UAF) at the event’s Exit Ramp on April 3 at The Henry hotel in Dearborn, Michigan. AASA’s councils, representing key peer and product groups in the automotive aftermarket, sponsored a “money grab” booth at the reception. Participants took turns grasping for cash in the “wind tunnel” booth while learning more about the councils’ value, programs and activities. All cash caught in the booth was donated to the University of the Aftermarket Foundation, which has funded millions of dollars of scholarships, grants, research and ongoing educational programs to help develop a strong, knowledgeable aftermarket work force since 1986. AASA received a University of the Aftermarket Foundation Lifetime Trustee Award recognizing its contribution to the UAF fund, a designation reserved for those donating $100,000 to $249,999 to support the foundation’s mission of providing scholarships and educational opportunities to the next generation of industry leaders. AASA Senior Vice President Chris Gardner serves as AASA’s representative for the Lifetime Trustee position with the University of the Aftermarket Foundation. AASA’s councils serve as forums for the exchange of best practices, networking with industry peers and drivers of the association’s key initiatives. More information about all of AASA’s councils is available here.